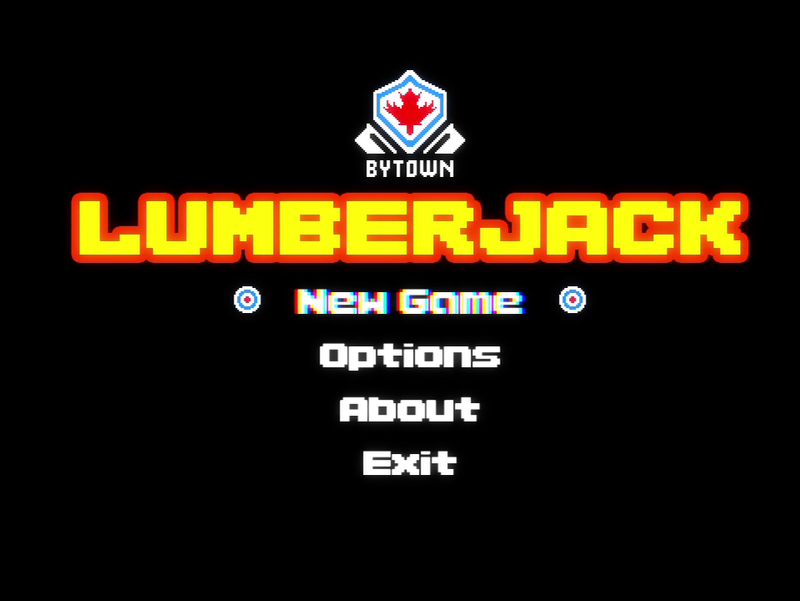 A few days ago we got a review code for a game called “Bytown Lumberjack.” Those of us at BLHQ are generally of the belief that there simply aren’t enough games that prominently display flannel and axes, so we decided to take up their offer and give the game a try. 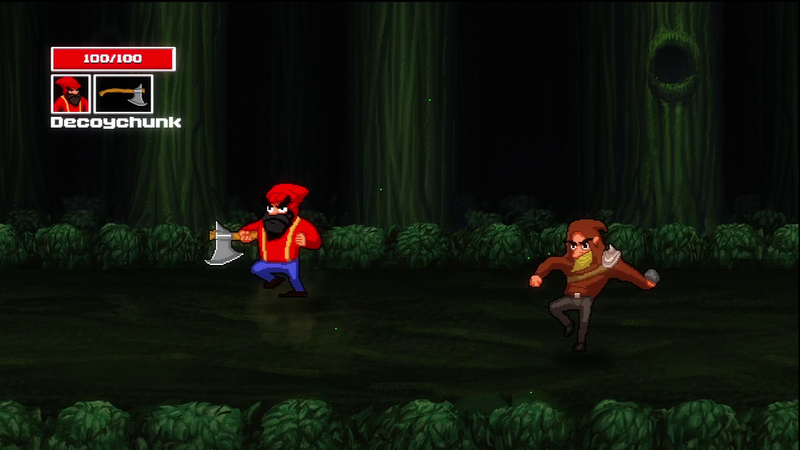 What we found was a beat ‘em up in the old school style. Here’s what we thought of it. 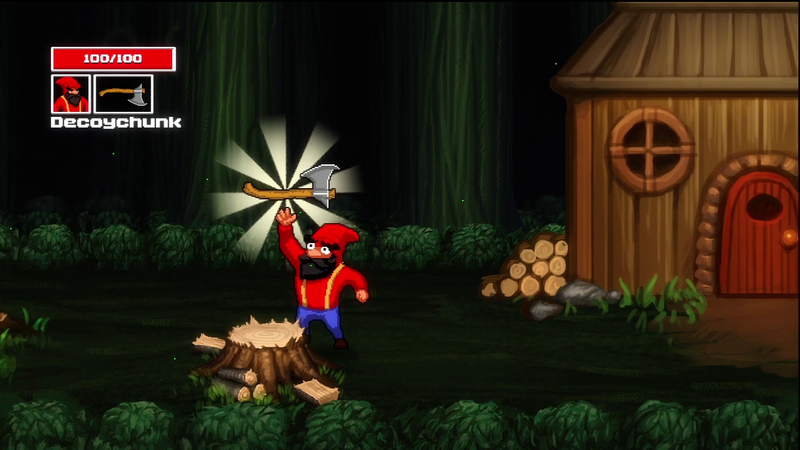 The graphics for Bytown Lumberjack are semi-retro, which for the indie game catalog is usually a safe choice. If I had to assign them to a specific era, I’d say they fall somewhere in the post-SNES to mid-90s arcade range. It varies from screen to screen and element to element. 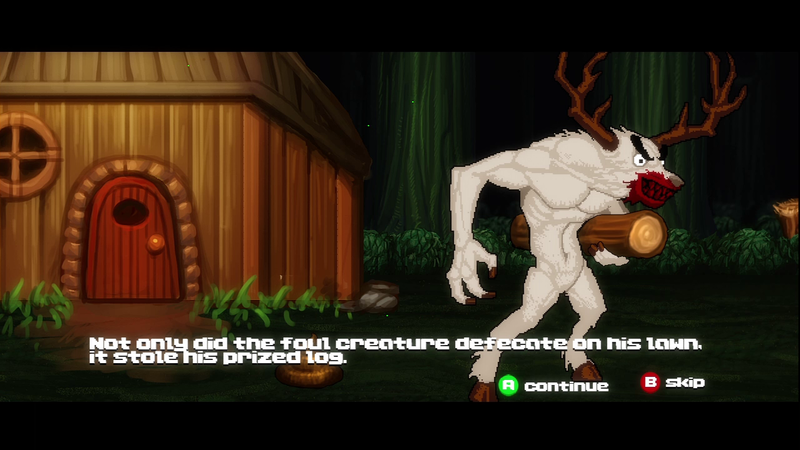 Sometimes the visuals show coarse pixelation, other times they are nearly smooth enough to appear vector-style. Meanwhile, the stationary elements like the logs blocking your way or the multilayer scrolling forest are decidedly high quality. Step right into the thresher, you furry, mask-wearin' devils! In terms of setting, there isn’t a terrible amount of variety; mostly just trees with gradually more sinister coloring. On the other hand, the enemies are refreshingly diverse. In a game like this it is traditional to have maybe four or five enemies, then do some heavy palette-swapping to fill out the rogues gallery. 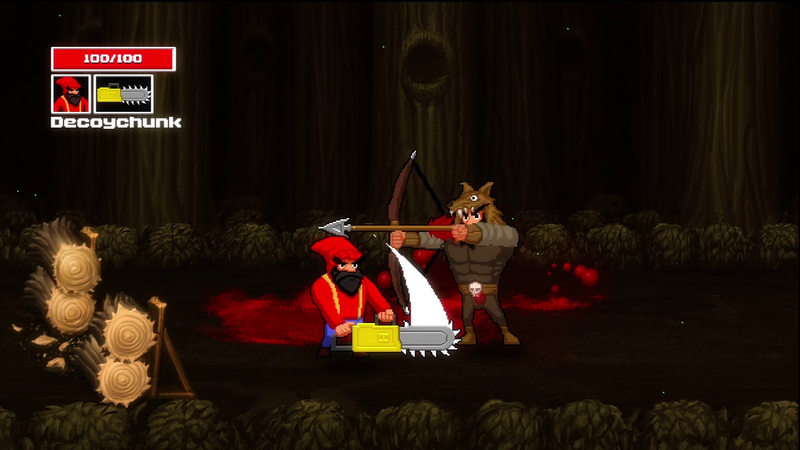 Bytown Lumberjack chooses instead to provide you with entirely unique sprites. 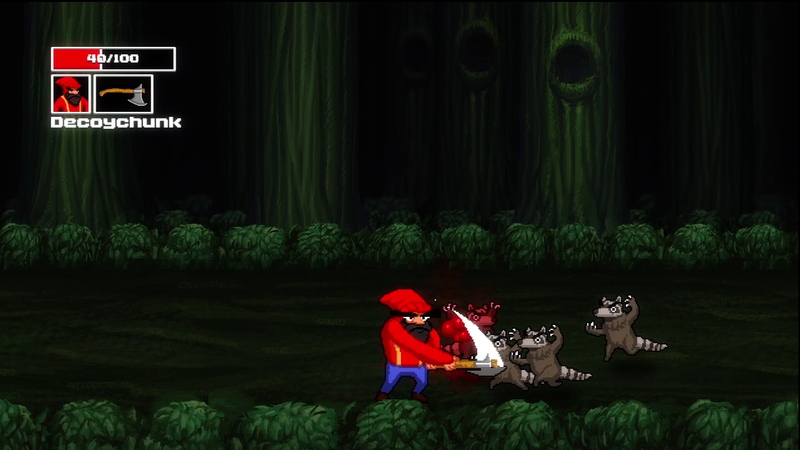 Raccoons, wolves, porcupines, and other woodland creatures team up with hobos of various flavors, and even barbarians. 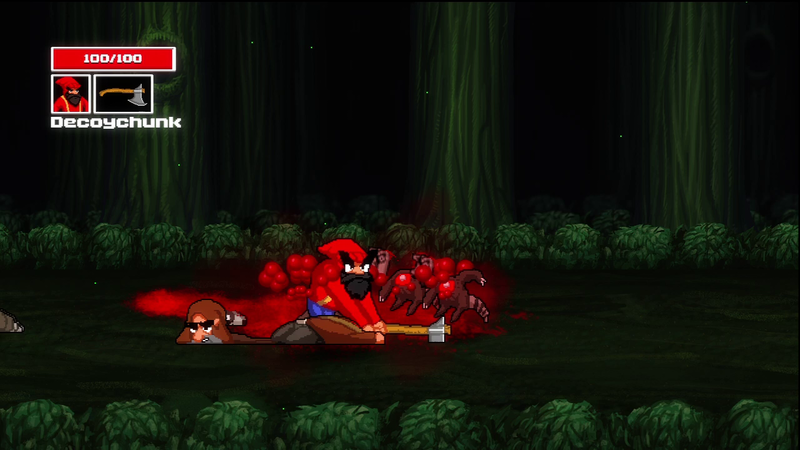 Every enemy has got an attack animation or two, and many even have multiple gory death animations. (I took a shameful amount of joy in the act of slicing up legions of raccoons, then splattering around in their guts, I must admit.) Overall, I’d say the graphics are a real strength. While I was certainly a fan of the graphics, I was more lukewarm on the gameplay. You have two attacks; one fast, and one heavy. That’s it. The only other thing you can do is move. Even the usual beat’em up staples like dash, jump, special, and grapple are missing. As you might imagine, this does not lend itself to an extremely wide range of strategies. Mostly you will scroll forward enough to spawn a cluster of enemies, line up with them, and hammer fast attack until they are a bloody pulp. Here and there you’ll encounter an enemy that requires a swipe or two of strong attack in order to render them killable, but mostly a quick finger and the fast attack button will be your primary interaction with the game. Looks like somebody brought a bow to a chainsaw fight. That’s not to say that there is no room for strategy and nuance, mind you. Each enemy takes a set amount of damage to kill, and once you work out what number of strong and weak attacks will do it, you can set up a combo of sorts to dispatch them most efficiently. And efficiency is something you’ll seriously want to perfect, because there is one enemy in particular that will make your life a living hell if you don’t take it out quickly. I am speaking of the stone-throwing hobo. This guy throws stones (as the name would suggest) that do 5% damage each. The stones are thrown directly at you, and because we are dealing with flat sprites on a pseudo-3D playfield, it is very difficult to tell whether it will or will not hit you based on its current trajectory. Hitting these guys doesn’t interrupt their attack, so if the game throws more than one or two on the screen (and it will) you are going to have to take them down quick, lest you be pummeled to death. Note that I am running away from the man with the rock. The difficult to determine depth was a continual source of difficulty for me. There were times when enemies that looked like they should have been feeling the wrath of my logging equipment turned out to be just a hair too low, and thus were blissfully swiping at me while I did no damage. Other times there were bear traps on the ground (which didn’t even attempt to trap the bears, mind you) that I had difficulty avoiding simply because I couldn’t tell how thick they were supposed to be. 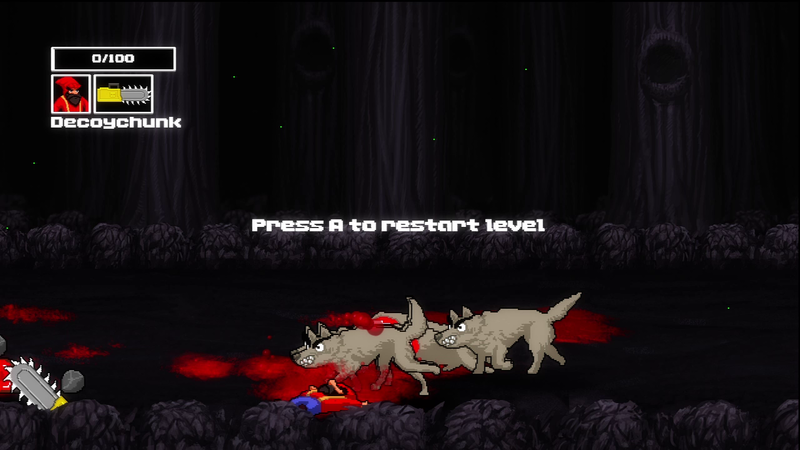 Here and there another quirk in the gameplay would rear its head, like the wolves pushing me back and causing me to turn around, then continuing to push me back and keep me turned backwards so that my weapon was useless against them, but in general there didn’t appear to be any glaring bugs. Rounding things up, there were a few non-standard play elements that I liked seeing. 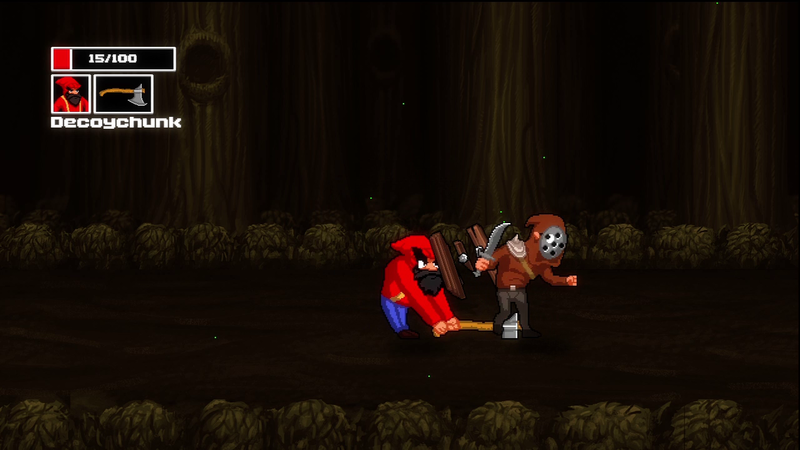 About half way through the game you upgrade from an ax to a chainsaw, for instance, and you get a single opportunity to upgrade your lumberjack for more health, more speed, or a single revival. 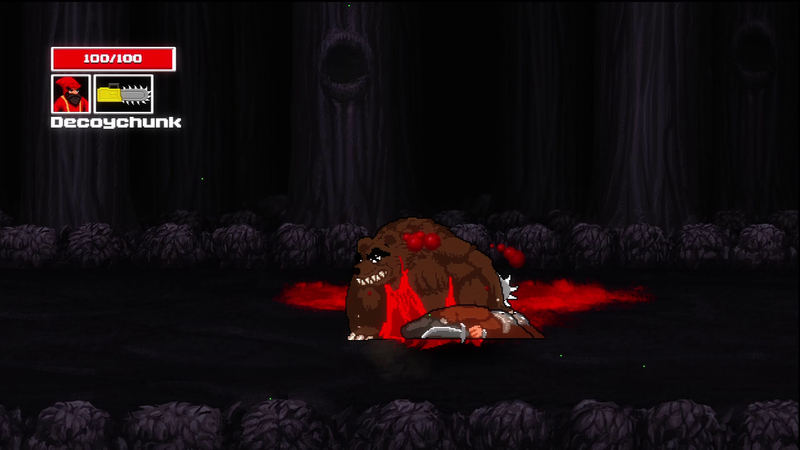 (That revival is handy, seeing as a death sends you back to the beginning of the level, and there are no health items.) It looks like there were twenty levels in total, which a dedicated player should be able to blow through in an hour or two. Aside from scattered sounds of shredding viscera and growling chainsaws, the audio of this game is a single rocking chiptune song. Thumbs up on that. In the tradition of all great beat’em ups, the story of this game is as follows: A large, angry man decides to go on a cross-state killing-spree, seeking revenge based upon a very flimsy pretense. In this case, you are a lumberjack, and one day you witness what appears to be some manner of carnivorous albino elk-man defiling your lawn with his naughty leavings, then taking your ‘prized’ log. As stories go, what it lacks in depth it more than makes up for with uniqueness. How exactly said elk was able to enlist the help of all woodland creatures, as well as the local population of transients and barbarians is somewhat unclear, but presumably mind control is somewhere in the equation. 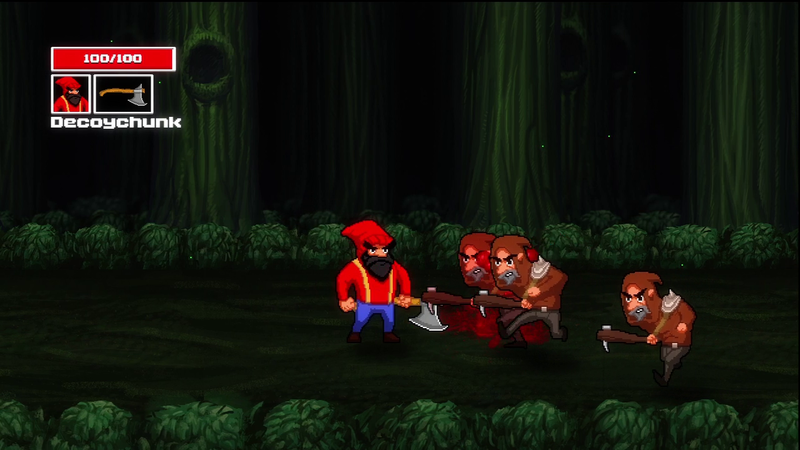 All in all, Bytown Lumberjack is a good looking, good sounding game. The gameplay is a little thin, but there are few glaring flaws. It is a game that would have been very at home on the NES, but with graphics you’d expect to have to pump quarters into. 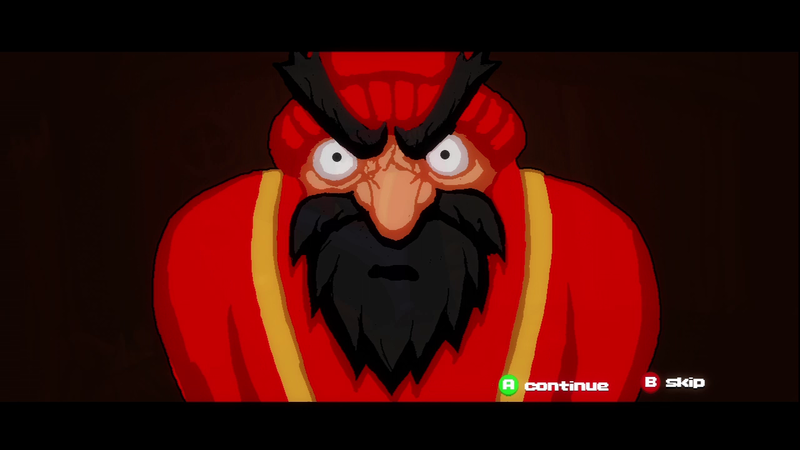 6.7 / 10: A humorous and attractive old school beat’em up with so-so combat but good enemy variety. Step right into the thresher, you furry, mask-wearin’ devils!